Our lives begin to end the day we become silent about things that matter: Dr. Martin Luther King Jr.
Shahram Marleen, Social Secretary of the Muslim Community Association, was MC of the program which was paused for the Asr prayer. Many of the attendees went to the prayers hall to watch how Muslims pray. They thanked the ISEB for providing an opportunity to watch a Muslim prayer live. Bob Wieckowski, California state senator. Patrick Burt, Mayor of Palo Alto. Bill Harrison, Mayor of Fremont. Lily Mei, Vice Mayor of Fremont. Shirley Lin Kinoshita, Silicon Valley United Nations Association‐USA president. Rev. Ben Daniel, senior pastor, Montclair Presbyterian Church in Oakland. Rabbi Sheldon Lewis, Past President of the Board of Rabbis of North California. Rev. 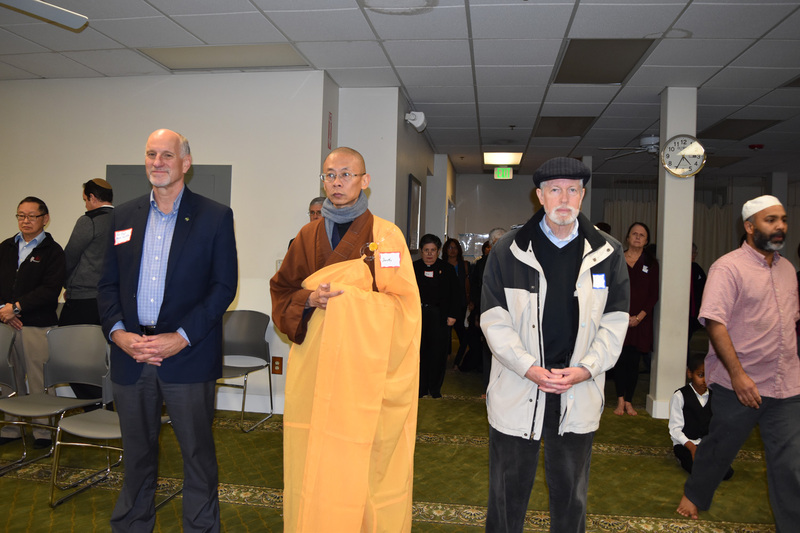 Dr. Andrew Kelle, chair of the Board Silicon Valley Interreligious Council (SIVIC). Rev. Dr Eileen, Altman, Associate Pasto, First Congregational Church of Palo Alto. Rev. John Oda, pastor, Lake Park United Methodist Church, Oakland. Juliette Suarez, Fellowship of Reconciliation. Dr. Sharat G. Lin, San Jose Peace & Justice Center & South Alameda County Peace & Justice Coalition. Rev. Melanie Weiner, associate minister at Foothills Congregational Church in Los Altos. Girish Shah, past-president and cofounder of Jan Center of Northern California in Milpitas. Rabbi Chaim Koritzinsky, Congregation Etz Chayim, Palo Alto. Komal Ahmad, founder and CEO of Copia (which creates efficient food waste management and feeds individuals in need). Sun Hee Kim, pastor of Sait Paul Fremont United Methodist Church. Samina Sundas, Founding Executive Director of the American Muslim Voice Foundation, said her organization's initiative, the Miracle Movement of Peace and Friendship is aimed at fostering a tighter sense of community among the fellow Americans. "If all of us sit down with each other and talk to each other, all the ignorance and fear will just fly out the window," Sundas told the Mercury News, adding: "We could send a loud and clear message to the world: In California, this is how we do things. We support each other with kindness with love and with compassion." Syed Inamdar, the former President of the ISEB, also graced the event. His services for the ISEB and the Muslim community were recognized. Syed Inamdar, who was on wheel chair, was accompanied by his daughter Syeda Reshma Inamdar, who is also very active member of the Bay Area Muslim community. In following the theme of the event "Hands Around The Mosque," the guests clasped hands as they formed a circle in the courtyard of the mosque. The Hands Around the Mosque event included a candle light vigil around the Peace Pillar outside the Mosque and the Methodist Church. 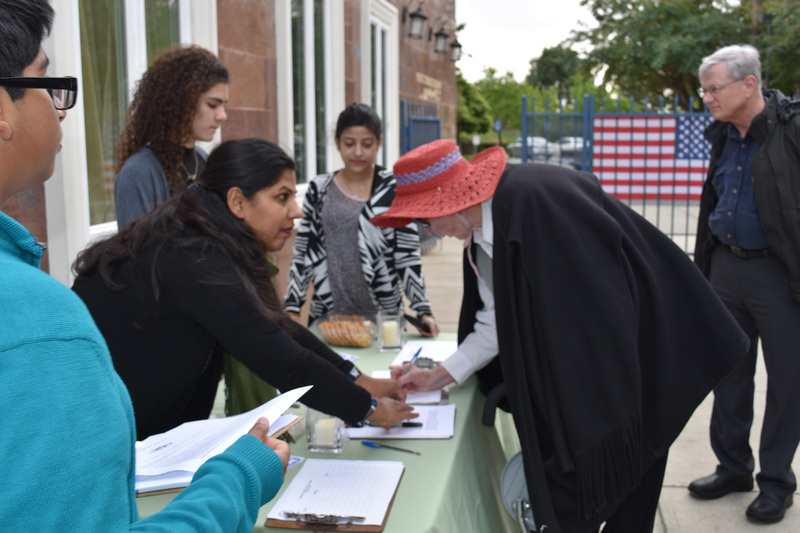 The vigil was aimed at expressing solidarity with the seven-million strong Muslim American community. At the end of the program, Areeba Yasin offered Vote of Thanks. Syed Rifat Mahmood, President of the ISEB interim board, thanked all ISEB volunteers who helped to make this program successful. The volunteers included: Shama Khan, Anamika Nath, Raffat Shareef, Akila Atarwala, Raheel Khan, Asad Khan and Human Khan. Special thanks to Farooq Hussaini for setting up the sound system. And special also thanks to Chandni Restaurant for providing dinner for 250 guests at a very short notice.